This review article surveys the author’s work during the last ten years. The research works have been carried out in the interdisciplinary fields of supramolecular, synthetic organic and materials chemistry. 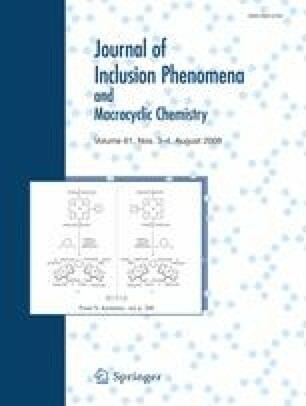 This review consists of the following 5 topics; (1) novel synthetic methodology for constructing benzyl ether-linked oxacyclophanes and oxacalixarenes by reductive coupling reactions, (2) preferential precipitation of C70 over C60 with p-halohomooxacalixarenes prepared by the above reductive coupling reactions, (3) highly practical purification of fullerenes by filtration through activated carbon thin layer, (4) host-guest chemistry of C60 and C70 with porphyrin monomers and dimers in solution, and (5) optical resolution of carbon nanotubes through preferential complexation with chiral diporphyrin nanotweezers. New terminology is also proposed in the definition of the structures and stereochemistry of carbon nanotubes. An erratum to this article can be found online at http://dx.doi.org/10.1007/s10847-010-9822-4. The author thanks the organizing committee of Host-Guest and Supramolecular Chemistry Society, Japan for giving him the HGCS Japan Award of Excellence 2007 and the opportunity of writing this review. He is also grateful to Professors Atsuhiro Osuka (Kyoto University), Takahide Kimura (Shiga University of Medical Science), Keiji Maruoka (Kyoto University), Kazumi Matsushige (Kyoto University), Akio Toshimitsu (Kyoto University), Shuji Aonuma (Osaka Electro-Communication University), Yoshihiro Matano (Kyoto University) Tadashi Mori (Osaka University), Tomonari Wakabayashi (Kinki University) and Tetsuo Ishida (Shiga University of Medical Science), and Professor Emeritus Hitomi Suzuki (Kyoto University), Dr. Naoki Yoshimoto, Mr. Takeyuki Itabashi and Dr. Shinji Yamada (Hitachi, Ltd.) for their valuable suggestions and encouragement. He acknowledges Professor Hidemitsu Uno, Ms. Akiko Fujimoto, Messrs. Kazuyuki Tominaga and Masakazu Hashimoto (Ehime University) for the preparation of porphyrin dimers, Messrs. Mineyuki Arikawa and Yasuharu Kikuchi (Frontier Carbon Co.) for helpful suggestions for fullerene purification, Dr. Mitsumi Uchida (Osaka Prefecture University) for proofreading his papers, Professor Yasushi Kawai for allowing him to use the CD spectropolarimeter, Mr. Yasushi Nakata and Ms. Ikuko Hamagami (Horiba, Ltd.) for taking photoluminescence spectra, Messrs. Takashi Onozawa and Susumu Kosugiyama (Tokyo Chemical Industry Co., Ltd.) for the assistance of experiments and kind donation of some reagents, and the members in Central Research Laboratory of Shiga University of Medical Science for helping us in various kinds of instrumental analyses. His sincere gratitudes also go to all the collaborators in Kyoto University and Shiga University of Medical Science, in particular, Dr. Xiaobin Peng (Shiga University of Medical Science), Dr. Sumanta Bhattacharya (The University of Burdwan, India), Mr. Naoki Kadota (Kyoto University), Mr. Takanori Shimawaki (NEC Lighting, Ltd.), Dr. Marilyn D. Milton (Indian Institute of Technology, Kharagpur, India), Dr. Tatsuya Takimoto (Shiga University of Medical Science), Dr. A. F. M. Mustafizur Rahman (University of Dhaka, Bangladesh), Dr. Toshiyuki Ohe (Daichi Kasei Co.,Ltd), Dr. Ajoy Kumer Bauri (Bhabha Atomic Research Centre, India) and Dr. Takefumi Chishiro (Kyushu University). His works described here were financially supported by Integrative Industry-Academia Partnership including Kyoto University, NTT Co., Pioneer Co., Hitachi, Ltd., Mitsubishi Chemical Co. and Rohm Co., Ltd., Grant-In-Aid (No 17·05389) from Japan Society for the Promotion of Science, Industrial Technology Research Grant Program in 2005 from New Energy and Industrial Technology Development Organization (NEDO) of Japan and Grant-In-Aid for Research for Young Researchers from Kyoto University-Venture Business Laboratory (KU-VBL). This is a paper selected for “HGCS Japan Award of Excellence 2007”.